One of the questions I am most frequently asked by readers is: "When is Airborn going to be turned into a movie?" I still don't have a definitive answer to that, but I can at least tell you that it's recently taken a step closer. Airborn is a special book for me, and I decided that, if at all possible, in future, I would try to have a bit more control over what happened to any film adaptation. So I am very pleased to be able to tell you that I have optioned the book to Halifax Films and Oscar-winning producer Michael Donovan (Bowling for Columbine, Shake Hands With the Devil). I will be writing the first draft of the screenplay, and will act as an executive producer on the project. So here's hoping for an excellent second take! Airborn is one of my favorite books of all time, and every time I read it (which is often! ), I envision what a movie version would look like. Obviously it won't live up to what I've built in my mind (few book-based movies do), but I'm extremely excited about this, especially having you involved with the screenplay. I simply love the Airborn trilogy, and cannot wait to see a movie about it; or possibly another book!!! That's going to be awewome! Awesome! It's great you actually get to write the screenplay this time. Here's to hoping this goes better than the last try! Best news I've read in a while! Nice! Can't wait to see it! Will be good! Wonderful News! Keep us posted. thank you for keeping the proper idea of Airborn, instead of having someone rip it to little pieces. sorry if i am interrupting anything. This is awesome!! So excited!! I'm extremely excited about this news!Please ensure the film is as true to the book as possible;including in how the characters,ships,environments,and creatures look and are portrayed.Will you afterwards proceed to option movies for the two sequels as well.I also look forward to a fourth Airborn novel too.Thanks so much,Ken! This is extremely amazing news! I love the Airborn books. I hate it when people turn the books into a stinky movie. I make me mad. Hopefully, this will turn into a good movie! Also, I was wondering if you are going to make another Airborn book? I am so excited that you have such a solid team making Airborn! The series are one of my favorite ever, and this is just the best news. Thanks for making it happen!! I am in awe that the movie is picked up again. I thought it would never happen. But something tells me you worked hard to find the right people to work with. I remember buying Starclimber together with The Hunger Games by Suzanne Collins. As much as I enjoyed The Hunger Games movie, I really wanted Airborn to have the movie it deserved. I'm trying not to get ahead of myself too much, but I believe Chloe Grace Moretz would make a fascinating Kate de Vries. She is the perfect age, but in her roles she acts very mature (just like Kate!). The role of Matt is harder for me to picture (mostly because I pictured myself in those pirate fights and space exams you blissfully described). But I can't wait to see this project develop even further. With you writing the rough draft, I can see this movie taking flight. Oh my gosh! I looked up Chloe Grace Moretz on google and I believe you have hit the mark my friend! She looks exactly how I always pictured Kate! Plus, she seems to act in many roles that fit Kate's character as well. I totally pictured her just like Mortez! This book was the first in my life to truly move me. I had chills during the scene on the catwalk when the Cloud Cat is RIGHT THERE. It would be such a unique EPIC movie seris, kinda like The Golden Compass, or Narnia. But Airborn better be given justice if made into a movie...it's just amazing. I hope this movie works out. I read this book years ago, and I love the series. I can't wait for the movie adaption. Or the next book! PS- When reading the novels, I've always imagined Emma Watson as Kate deVries. I know it's probably not a feasible suggestion, but. I saw an earlier comment that had Chloe Grace Moretz as Kate, who is not quite as famous as Emma Watson,so she would probably be a more feasible option, but if somehow Emma could do it, that would be epic beyond epicness. I agree,but I picture both of them as Kate. BRAVO! I've loved the Airborn trilogy for years and always thought they would make incredible movies. I was so disappointed when the last movie deal fell through, so now I am super excited! Congratulations and best wishes on your future work! I enjoyed the silverwing series. Airborn was a whole other matter. The main character is basically good but his view on reality is distorted. The Aurora is cool, but whats with the Hydrium? Why didnt you just say Hydrogen? Don't insult the noble gasses. In the cover picture Matt would freeze at that hieght! He thinks he's such a big shot walking around with Kate. Fix it, and then I might respect you again. A word of warning to the director of this film, DON'T DO THIS! THE BOOK WAS BAD AND THE MOVIE WILL BE BAD TOO! I think Hyrdrium is a mixture of Hydrogen and Helium. I think that Mr. Oppel was being very clever when he invented it and I found that it helped make the book world, which is kind of a reality-fantasy Earth, more real. He is a very creative writer and it is your opinion to dislike Airborn though. Stefan, are you thinking of a different book? This is FANTASTIC news! I am such a fan of the Airborn series and I remember reading the articles about the first time it was op-ed for a movie, and even though I was disappointed it fell out, I was more disappointed that the movie company wanted to completely change the story. So many high fives to you for standing up for your awesome characters and storytelling. And I think the best news is that you will have the creative control you deserve. So write away my friend! I trust you wholeheartedly and I will be keeping my fingers crossed that everything is a success! What a coincidence. I was reading the Wiki entry on Stephen Sommers the other day and that's when I learnt about his aborted project on Airborn. Not having heard of this trilogy, I immediately looked it up and found the setting similar to Scott Westerfeld's Leviathan trilogy which I tremendously enjoyed reading last summer. 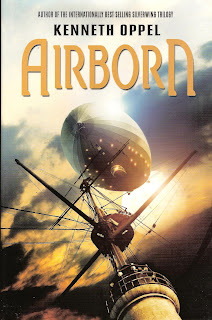 So, I have just started off on Airborn (have finished the first 2 chapters) and found it very engaging, and the character of cabin boy Matt Cruse immensely likeable. So, it's wonderful news to hear that Airborn will finally be getting the big screen treatment. Wish you the best and looking forward to it. What are you talking about? Airborn was great! Exciting! Hope everything works out well - I'd LOVE to see an Airborn movie! Is there any thought about another Airborn book? I feel like there can be more to the story and that there is still a lot left open after Starclimber. I really want to see another book where Matt and Kate's relationship really develops and the idea of travelling to other worlds or the moon as it was mentioned in Starclimber. Wow great news!!! When are you planning to release the Airborn movie? Would love it to be made into a film, i loved the series of books! The Airborn and its sequels are some of my absolute favorite books and I would love to see them made into movies. Best book I have ever read. No question the movie will be one to look for! The book was one of those books I read on my own time even though I don't like to read! I CAN'T WAIT ANY LONGER!!!!! I am of two minds here. On one hand, I can't imagine how any filmmaker could do justice to the greatness of this book. There are too many great nuances that could be missed, and I am rarely satisfied with movie adaptations. On the other hand, how could I NOT want to see a movie version of my favorite book series from my 2012 reading? And, if you, Mr. Oppel, are writing the screenplay, I have confidence it will be wonderful. Heck, they managed to do an excellent job with Sachar's book "Holes." Here's looking forward to a great turnout! I'm really looking forward to reading your Frankenstein books soon. Keep up the top-notch work, Mr. Oppe1, and thank you! Heard the book is amazing! Cant wait to see the movie! I hope the movie does the book justice I love it. But can some one tell me what color the aurora is?? It seems to be different on different covers. Thank you Mr. Oppel for considering making a movie with out tearing apart it. There are no words to describe how excited I'd be to see more of the world, movie form or book form. Just perfect. I absolutely love the entire book series and have read it many times. I think that they deserve a movie..... I would definitely go see it. I also think it would be cool if they could make a fourth book.... it leaves off on a cliff hanger. I have to say, I'm really excited to hear this news. Especially the fact that you're writing the screenplay. Handing something to another writer means certain aspects of the story get lost. Also, Airborn always seemed like such a visual story with airships and old fashioned adventure. My one hope is that it isn't over CGI'ed. I'm getting my degree in aerospace and I've seen actual equipment. I would love to see the realism of the story be emphasized in the implementation of the effects for the movie. CGI makes things seem fake and imaginary. What was great about Airborn is that for all the fantasy aspects, there was a realistic side to it in the Darwinian exploration and long term ship travel. I just wanted to shake your hand, Mr. Oppal, and tell you thank you so much for not letting Universal Pictures destroy your amazing novel. Too often have I seen a good book ruined by an awful movie adaption, and I would have been heart-broken had this happened to Airborn. I'm so glad you've taken control of the script and I can't wait to see what is in store! Your Airborn trilogy was the best thing I read since the Harry Potter books, your way of writing fascinates me and I would be enthralled if you could make a 4th book; as well as a movie!!! This is exactly the kind of statement that all readers have wanted every book-turned-movie author to write! "I will not let them change it into unrecognizable garbage". Thank you! P.S. I kept thinking how cool this book would have been as a Studio Ghibli movie. For fans of Miyazaki, you will know what I mean. So is there gonna be a movie or not? I don't want to get my hopes up too much, but I am waiting with baited breath!!!! I'm so glad the screenplay is being written by Kenneth Opple. i would hate to see Airborne turn into a movie about "mystical urns". P.S. i think Silverwing would make a great movie! I pray to the sky that this will be the movie that will not be a box office smash, but a destroyer. I'm fairly confident you will do well to guide the movie on to its right tracks and bull rush straight on to our starved fantasy minds from start to finish throughout the movie. Granted that there will always be a couple of details left out as such movies from book originate from but assuming, with the budget and all, you will satisfy the long awaited fans who read the Airborn series like crack. Get hooked once and your open to the world of... everything. Yayy! I'm so glad that you yourself, Mr. Oppel, get to write the first draft of the screenplay! I would hate to see the cloud cats replaced with "mystical urns." (Where did they come up with that?) Very eagerly looking forward to the movie!! There is a slight science flaw in the escape from the pit. It would not be possible to escape from a pit filled with hydrium in a balloon filled with hydrium. The balloon would float no better than a balloon filled with ordinary air will float in a room of air. For a balloon to work, it has to be filled with something lighter than the surrounding atmosphere. Perhaps for the movie you can write it so that the pit is "filling with hydrium" (the lid had just been opened, after all) but is not yet filled. Hollywood gets something like 50,000 new scripts every year. Why would they take out the cloud cats? Probably because they liked their OWN idea about the urns so much there wasn't space left for the cats. I'm so excited.Good luck with the movie!!! And please make another sequel to airborn. Its the best series I've ever read. There is are two sequels to Airborn: Skybreaker and then Starclimber. The story ended off pretty nicely after Starclimber so to do a fourth book would be difficult. He could lead off with Kate's and Matt's wedding and then create some other intruigingly intresting creature. PLEASE TELL ME ITS GOING TO COME OUT SOON! ! ! ! ! ! I'm a 13 year old boy that enjoys reading overall, But to tell you the truth... In the beginning, I didn't think much of this book series, but once I started reading, I was very intrigued and interested in the film and sequel of this book. One thing Airborn has over other movie books is the length, there would be no need to cram tons of backstory and charachter depth into an hour and a half movie that most other incredibly long books need to do. Airborn is not outrageously long, and can all fit within the paramaters of film with enough charachter depth in matt and kate to keep viewers very interested. I think it's stupid when they change the book completely for the movie. But this took it to a whole new level! Hallo, I really love the Book and I would love to see the movie, too. Are there any Updates concerning the movie? I KNOW IT IS NOT SMART TO MAKE A MOVIE ON A BOOK AND THEN TAKE OUT THINGS AND REPLACE THEM WITH OTHER THINGS THAT WERE NOT EVEN IN THE BOOK. FOR EXAMPLE THE MOVIE CORALINE, THEY TOOK OUT THE MOVING TO MICHIGAN PART AND REPLACED IT WITH A CAR CRASH INSTEAD. MY OPINION IS THAT THE CLOUD CATS SHOULD STAY IN THE MOVIE BECAUSE THEY PLAY A BIG ROLE IN THE STORY. BY THE WAY I HAVE A QUESTION. I AM A BOY (13 YEARS OLD) WHO CREATES CGI AND I WOULD LIKE TO KNOW IF YOU ALOW ME TO MAKE THE AIRBORN MOVIE AND THEN PUBLISH IT ON YOUTUBE. I love airbron and skybreaker! Kenneth and I share a mutual love for lighter than aircraft, and I look forward to a movie, but I think I'd also like a fourth book that takes place back on earth, and back on an airship.